This is a delightful location and time of year to go on a painting trip. 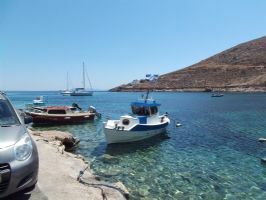 So much to inspire on Kalymnos, an off-the-track of the traditional holiday destinations.......it offers peaceful, quiet, inspiring scenes from traditional style boats, quiet beaches and seascapes, traditional Greek white and blue houses. We will visit a variety of places to give alternative inspiration, sample the delightful local food and meet lots of interesting people. 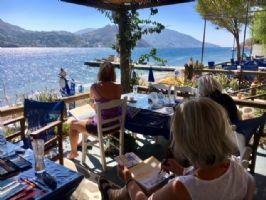 You will stay in excellent comfortable accommodation, and benefit from the expertese of full time artist/teacher Podi Lawrence, and British tour guides Liz and John to ensure a relaxing, creative and enjoyable stay. We also include a welcome evening and a celebration night to round off your week. Podi encourages you to experiment with ways of applying any media. Learning to ‘let go’ is possibly the best lesson to learn when it comes to painting. For a holiday such as this Podi recommends sketching media, watercolours, pencils, or acrylics - travel light. She teaches all levels whether beginners or experienced, seeking new inspiration you will find plenty on Kalymnos and Telendos. Podi believes in the power of learning from demonstration and application. In some of her most recent work she has used Liquitex acrylic ink and will be providing some for you to try out. (see her painting of the rocky hills on page ). Podi is also offering a FREE 2 hour demonstration and trial of Liquitex Acrylic Inks at her studio on Portland, Dorset before the holiday for anyone booking this holiday. Join us for a week or two on this island paradise - just painting and enjoying the company of like-minded people.....well maybe a bit of swimming, enjoying good cuisine and wine and the greek hospitality and history. You find them here, in the cafe, you find them there on the beach, you find artists everywhere! "Thank you very much for all you did to make the holiday such a happy one. My daughter and I feel we learnt a lot.....thank you very much for all you did to make the holiday such a happy one." ......Gerry, Bucks. Simply Degas, refreshing post-impressionism Podi Lawrence captures the exquisite in lush landscapes, in the story-telling of her portraiture, and in jazz-infused snapshots of life caught on canvas. her versatility in all mediums, a rarity; her spontaneity & passion with paint, a treasure.